Her bigos, pancakes and mazurki were admired not only by her family but also by the Parisian and New York bohème. Nela’s Cookbook, which was published almost 40 years ago, was intended just to be a form of therapy after her marriage with the legendary pianist Arthur Rubinstein ended. But it became an instant classic. What made her cookbook special was that it wasn’t written for chefs, but rather for ordinary people who enjoyed cooking or wanted to learn how. Nela, the youngest daughter of Emil Młynarski, the conductor and co-founder of the Warsaw Philharmonic, discovered her passion for cooking in her family home. At just 18, she fell in love with the great pianist Artur (Arthur) Rubinstein. In 1932, after a previous marriage, Nela Młynarska married him. The moment we bite them, the hot, liquid marrow should squirt directly onto our palate. This is something extraordinarily good (…) Only at home would there be so many of them served that I could eat until I was full. The book also contains the recipes of the talented Lithuanian cook employed by Nela’s parents – the wonderful Barbarka, who, even during the World War I (when Nela and her numerous family-members ended up in Moscow), performed miracles to create tasty dishes from the simplest of ingredients. That is why the book has a dish ‘à la Barbarka’: potatoes stuffed with mushrooms and onion. This ultra-simple recipe was supposed to be the best in the repertoire and its secret was that the drilled potatoes had to be boiled beforehand. One of Barbarka’s recipes (for pâté) was even printed in the New York Times! The family recipe for almond mazurek so delighted Baron Edward de Rothschild in Paris that he asked for it to be presented to his own cook. Nela Rubinstein was also famous for her masterful pastries – not only the mazurkas but also creams, puddings and pound cakes, which, before the invention of electric mixers, had to be prepared by the entire family. Rubinstein said that she often prepared two or three deserts for parties: ‘not to show off, but so that my friends could pick what they like the most’. Nela often said cooking requires intuition and joy, which meant rejecting the rigid rules and trusting ones imagination. After five days I entered the dining car and, to the great surprise of the comrade cooks who had never seen a ‘capitalist’ cook before, I fried us some scrambled eggs for dinner. Mom had something you could call perfect taste. She was never mistaken in distinguishing the ingredients of a dish served in a restaurant and was later able to prepare the same dish at home, usually better. She depended on intuition and never weighed ingredients, except maybe for the pound cake. But the recipes required exact amounts and this measuring and weighing was really difficult for her. Because Rubinstein’s collection included recipes from friends and befriended cooks, it was full of different languages: Polish, Lithuanian, but also English, French, Russian, German or Spanish. For example, Sergei Rachmaninov’s wife provided a recipe for a Russian coulibiac filled with cabbage and mushrooms. It was taken from a cook who had once worked for the last Russian tsar. Other than intuition, she valued speed in her cooking. She was familiar with technological advances and culinary novelties such as pressure cookers, food processors or even stock cubes that are so vilified by food-lovers nowadays. She liked to cook simple things. One of her favourite dishes was chicken meatballs with dill. She also often prepared łazanki with mushrooms. Both dishes were highly esteemed by American guests. My mother really was an extraordinary cook, full of unquenchable inventiveness. She cooked fast and without fuss. She could be baking a cake, talking to a guest in French and listening to an English TV show at the same time. Every meal gathered the entire family around a table and offered them a moment of rest after a day stuffed with various activities. This soup, very hot, served in deep cups, was always the first course during dinners I prepared after concerts for my husband and other artists. 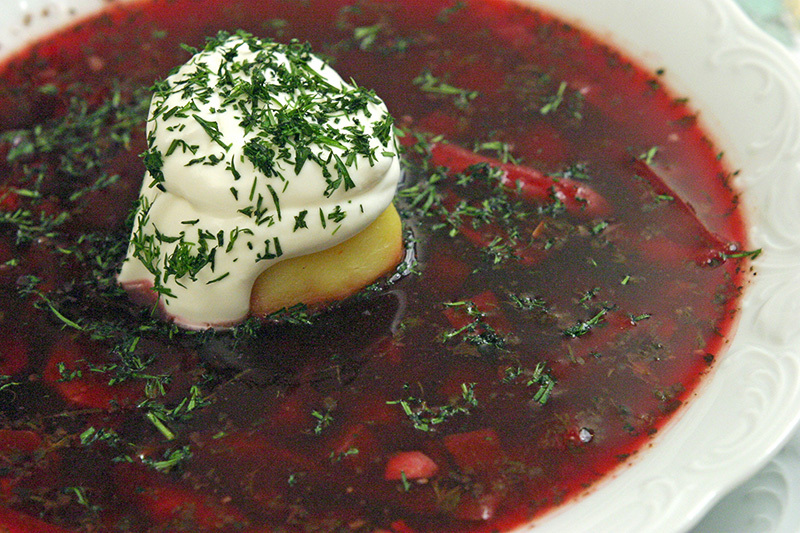 Nothing gives as much energy as a delicately sweet borscht. She also shared this sentiment towards other homemade evergreens, such as pancakes, pierogi leniwe, łazanki, noodles or blini – flavours that taste best at home because a lot of heart and soul is put into their preparation. One day, early in the morning, dressed in the worst and oldest rags, we left home. Our equipment consisted of a large jar filled with bait (horse liver bought in some suspicious butchery) and a large assortment of buckets, sticks, sieves, strainers and colanders (…). Of course, the members of the escapade shared the spirit of competition (…). Our highest record was catching 450 [crayfish] during just a single trip! I do not have to tell you what a feast it was. In her book, Nela devoted many pages to Polish dishes made of crayfish, just like she did with bigos and the Polish tradition of mushroom picking. The recipe for crayfish soup with crayfish butter meatballs makes one dream of the good old days – because today, due to the lack of a previously common ingredient, it is really impossible to prepare the soup in its old Polish version. Nela Rubinstein was famous for her parties. The Rubinstein’s home was a place where the greatest artists of the day came to wine and dine. She fed important figures from the arts and political world – it is enough to mention Prince Rainier of Monaco with his wife Grace Kelly, who was her friend. The women played Scrabble together and Nela taught the princess how to cook. One time, a memorable party for fifty people almost ended in a disaster. One of the Rubinsteins’ servants quit her job the day before. In the end, Nela had to prepare a dinner consisting of a dozen or so dishes on her own. She succeeded. Next to French specialties the menu contained Polish treats: carp in jelly, łazanki with mushrooms, bigos with potato salad and a chocolate mazurek for dessert. Her bigos was the highlight of many parties. I must admit that I was never disappointed with it. It is a dish that is usually enjoyed by everybody and it is easy to make, even in large quantities. This resulted in a dish of refined taste that so pleased Artur’s refined friends that it soon became my plat de résistance. It was enjoyed at a party attended by artists in Montmartre in 1932, at a Hollywood banquet attended by filmmakers, at a dinner in Venice in honour of Igor Strawiński and at a charity ball for Polish refugees that was held in New York after World War II. A staging of the play Children of a Lesser God which starred the Rubinsteins’ son was celebrated with a large pot of bigos. Nela cooked enough for 45 people at a microscopic stove in a hotel niche. Moreover, one time Baron Rothschild himself sent over his chef in a Mercedes so that Nela would teach him how to cook bigos. 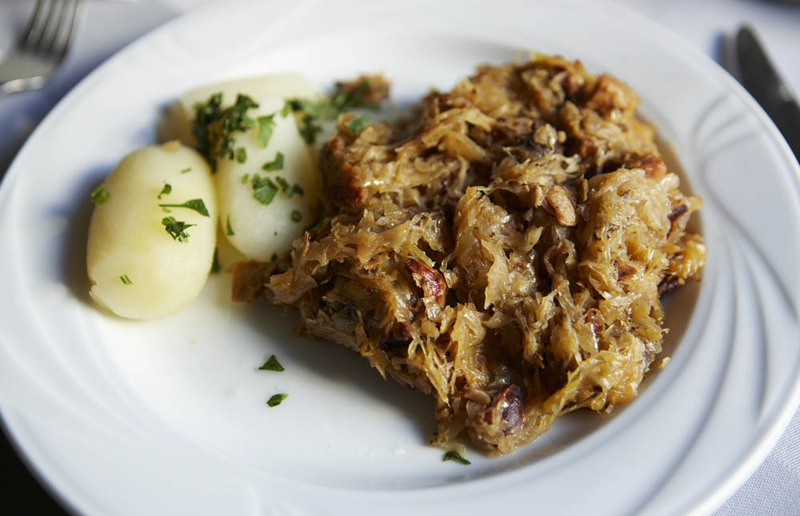 Who knew bigos could be such a classy dish! Just reading it brings great joy. It’s not only the recipes, but the dozens of stories, beginning from her childhood in Lithuania, all the way to far away travels and visits to the world’s most famous restaurants during her fifty-year marriage to my father. It is believed that Nela conquered Artur Rubinstein’s heart (who was reportedly a great foodie) not only with her intelligence and good looks but also with her cooking skills. Her still timely book can serve not only as evidence of the culinary tastes of the era and as a source of masterfully described recipes – it also contains knowledge of the world of that time. This is probably why the first edition of Nela’s Cookbook sold like crazy and many continue to use her recipes today.